I thought I would start with a little pre ginny before I get down to business. Or maybe I'm just avoiding writing her birth story. We found out we were expecting in early October 2009. Right after I got back from a trip to vegas. (sorry baby) We were 99% sure we conceived on our 1 year wedding anniversary. So the moment we found out, we quit smoking, and the bottles of wine started collecting dust. We weren't ready to tell anyone the good news until we made it to the 2nd trimester. My sister in law had just miscarried earlier that year, after trying for over a year, so we didn't want to rub it in her face. "Hey everyone, we accidentally got pregnant and you can't." So we camped out in our apartment waiting for our eight week ultrasound that seemed years away. I didn't look for a doctor, I just kept going to the same OB practice that I had my annual pap test at. My "OB interview" consisted of me saying "You guys deliver babies, right?" 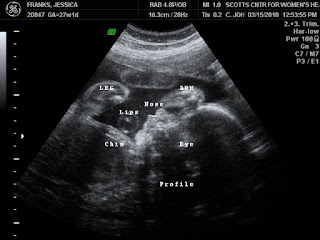 We saw our little peanut, everything looked normal, and time inched on. We looked for a house, I slept, and ate. At each appointment we were right on par, normal size, heart rate, blood pressure, etc. I was gaining a little more weight than everyone expected, but doing fine. In preparation for birth, I watched episodes of 'A Baby Story' on TLC, read 'What to Expect When Your Expecting', and that was about it. I thought that I knew enough, my doctor said he was on board with my natural birth plan, and all we were doing was waiting. We moved into our new house, painted the baby room, and got as ready as possible. I took one yoga class a week and called it good as far as exercise. My OB didn't tell me to do anything, so I didn't. Might be the reason I gained over 50 lbs. Week 37 went by, 38, 39, 40, and here we were at 41. 41 weeks and 1 day. Overdue with only a few contractions a day, and as far as I knew, my time was up. I never thought I would go late, but here we were! Monday June 21st, 2010. Induction Day.